Hunan wants its economy to "soar" and is promoting an innovation-driven strategy to boost growth, according to local officials. The strategy was proposed by Du Jiahao, Party chief of Hunan, when he delivered a report during the province's 11th Party congress in November 2016. "Innovation and opening-up are the two wings that can help Hunan's economy to soar," Du said, adding that an innovation-driven strategy is the hope and potential for Hunan's growth. The province is home to a number of cutting-edge and innovative science and technology achievements, including high-speed trains, hybrid rice and super computers. Hunan scientist Yuan Longping and his research team have developed several generations of hybrid rice, including the latest super rice, greatly contributing to the increase of grain supplies nationwide and even worldwide. Several locomotive and train manufacturers in the city of Zhuzhou are among China's major drivers in developing high-speed trains, which have placed the country at the forefront of global railway transportation. On Nov 20, the London Design Museum announced contenders for the 10th edition of Beazley Designs of the Year, and the world's first autonomous rail rapid transit developed by CRRC Zhuzhou Institute entered the shortlist. That nomination underscored the worldwide recognition already being enjoyed by the innovative project developed in Hunan. 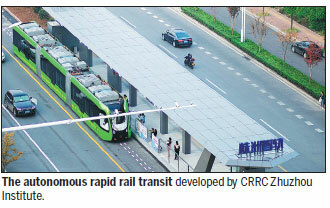 High-tech enterprises are deemed crucial players in Hunan's innovation-driven economy. According to statistics from the Hunan Provincial Science and Technology Department, 870 companies in the province were accredited as high-tech enterprises in 2016, pushing the total number of such companies to 2,212. Hunan's high-tech companies reported a total added value of 685.9 billion yuan ($106.3 billion) last year, with a year-on-year growth rate 8.1 percentage points higher than local GDP growth. Li Jianwen, an official with the department, said the Changsha-Zhuzhou-Xiangtan National Independent Innovation Demonstration Zone is the major base for the development of Hunan's innovative and high-tech industries. Li said the three cities that constitute the demonstration zone have their own features when it comes to industrial development. Changsha is a center of research and development, while Zhuzhou is famous for its manufacturing of transportation power systems and Xiangtan for smart manufacturing, according to Li. The official said Changsha is positioned as a destination for corporate R&D headquarters, design centers and modern service industries. In Zhuzhou, local companies are capable of developing a full range of power systems for aircraft, automobiles and rail transit systems. Xiangtan has attracted a number of robot manufacturers and players in the intelligent equipment sector. 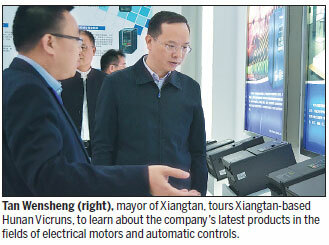 Tan Wensheng, mayor of Xiangtan, said the city aims to build itself into a "smart manufacturing valley" in Hunan. "To attract more investors, Xiangtan plans to release more preferential policies, including incentives for financing and recruiting," Tan said. The mayor said businesses in Xiangtan's smart manufacturing industry "are facing the best opportunities for growth", as the local government spares no efforts to support the development of the real economy. Yang Weiguo, mayor of Zhuzhou, said that Zhuzhou has developed into one of the transportation power system hubs of China. Some manufacturers there have grown into heavyweights worldwide. A China Power Valley Demonstration Center recently opened in Zhuzhou, providing an exhibition platform for local manufacturers. Changsha's high-tech development zone has attracted a number of R&D facilities, including a space research institution of the Chinese Academy of Sciences, a space industry materials institution and a smart manufacturing research center. The zone is also home to the country's first 3-D printing research institution. The zone is positioned as a technology development base for the real economy, especially the smart manufacturing sector, according to Zhou Qingnian, Party chief of the high-tech zone. Local statistics show that Changsha high-tech zone now ranks No 4 among all the high-tech zones in China in terms of the number of national-level R&D entities. The zone owns 25,000 patents granted by the State Intellectual Property Office, ranking it No 1 among all the development zones in Hunan.